The AirSaver product line is developed and distributed by ACM Technologies, Inc., a leading distributor of technology products for the office equipment and packaging industry. Founded in 1989, ACM is one of the largest national distributors of imaging products to the office supply industry. More recently, ACM has expanded to the packaging industry with its innovative line of AirSaver products. With four U.S. distribution centers located in California, Texas, Illinois and Massachusetts, ACM promises high availability, swift fulfillment, world-class customer care, and substantial cost savings. AirSaver Air Cushioning System is an eco-friendly, alternative packaging solution to traditional void fill products (paper, peanuts, foam, etc.). The AirSaver system provides on-demand Air Pillows to streamline your shipping operations and reduce costs. Its compact, tabletop design allows it to be used anywhere from a small shipping store to a warehouse with multiple shipping stations. No matter what you are shipping, AirSaver Air Cushioning System is simple yet effective for all your void-fill needs. Our AirSaver machines can generate both air pillows and cushion wrap on demand. They are light-weight and durable enough to provide excellent product protection and flexability in your shipping operations. Stop by our booth, SL 2165 to find out more about a FREE* Machine and Roll of Film. 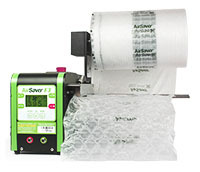 The Next Generation AirSaver On-Demand Packaging System can reduce your shipping costs. Come visit our booth and answer a few questions to qualify for a $50 gift card. Feburary 12, 2019, Corona, CA - In with the new, and out with the old, packaging supplies that is. The AirSaver system offers many advantages over traditional packaging materials like peanuts, paper or foam. The air pillow materials are stored flat on a roll until they are inflated for use, which significantly reduces storage and shipping cost. In addition, Air Pillows are cleaner and easier to use compared to traditional materials and are the preferred packaging material of choice by today's consumers. AirSaver films are recyclable and can be reused, which makes this product the most environmentally friendly packaging material in the market. Reduce your shipping cost and stop by our booth at SL 2165 to talk to our experienced staff to see if air pillows are right for your company. AirSaver will be exhibiting at ASDMarketWeek (Affordable Shopping Destination) in Las Vegas, Nevada at the Las Vegas Convention Center on March 17-20, 2019. Live demonstrations will be held at booth SL 2165 and AirSaver’s new F3 On-Demand Packaging System will be introduced along with several new set up and configuration accessories. The AirSaver product line is developed and distributed by ACM Technologies, Inc., a leading distributor of technology products for the office equipment and packaging industry. Founded in 1989, ACM is one of the largest national distributors of imaging products to the office supply industry. More recently, ACM has expanded to the packaging industry with its innovative line of AirSaver products. With four U.S. distribution centers located in California, Texas, Illinois and Massachusetts, ACM promises high availability, swift fulfillment, world-class customer care, and substantial cost savings. For more information, visit www.airsaverpack.com. 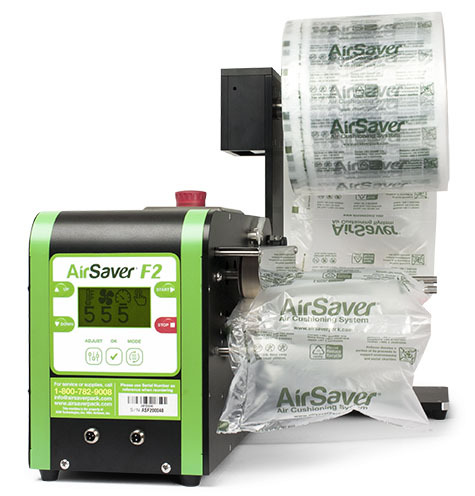 Our AirSaver machine can generate both air pillows and cushion wrap on demand. They are light-weight and durable enough to provide excellent product protection and flexibility in your shipping operations. No Training Required - Designed to work right out of the box.